Kevin Doyle talks to Vadim Barák of the Solidarita organisation in the Czech Republic about the problems and possibilities facing anarchists in the process of rebuilding a revolutionary movement. Anarchism is often seen as being broadly linked with the radical wing of the Environmental movement. 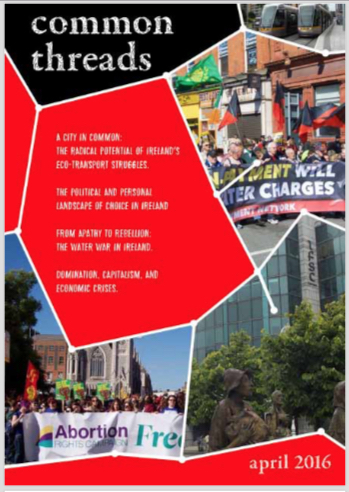 Ray Cunningham in reviewing ‘Anarchism and Environmental Survival’ considers these links and the influence of these movements on each other. 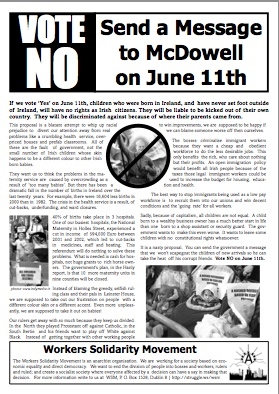 With racism on the rise in Ireland, it has become more important than ever for anti-racist activists to examine where such ideas come from and how they can be fought. In this article, the South African anarchist organisation, the WSF, puts forward its view that the fight against racism and the class struggle are inextricably linked. One time anarchist Victor Serge joined the Bolsheviks in 1918 and is often quoted by Leninists today to justify their repression of the left. Dermot Sreenan looks at his later writings and finds a Serge unhappy with many aspects of Bolshevik rule but unable to break with them because of the apparent success of the Russian Revolution. In June of 1795 several Irish Protestants gathered on top of Cave Hill, overlooking Belfast. They swore “never to desist in our efforts until we had subverted the authority of England over our country and asserted our independence”. Three years later 100,000 rose against Britain in the first Irish republican insurrection. Andrew Flood examines what they were fighting for and how they influenced modern Irish nationalism. The Friends of Durruti organisation, which arose from the ranks of anarchist militants during the Spanish Civil War, condemned the CNT and FAI members who joined the anti-Franco government. For their pains they were accused of wanting to establish an “anarchist dictator- ship”. Alan MacSimóin reviews the first English language book about them, and looks at the lessons to be learnt from Spain. So you want to change the world? What next? 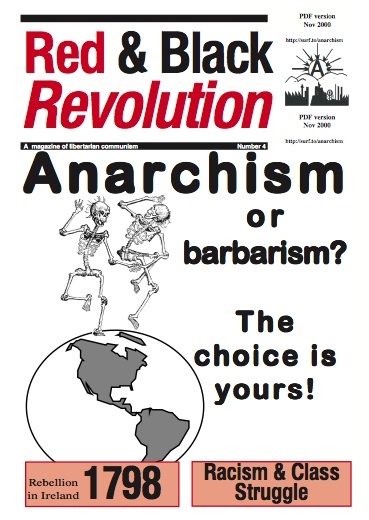 Unsurprisingly this simple question has provoked much discussion among anarchists. Aileen O’Carroll and Alan MacSimóin look at the answer provided by some Russians. The “Good Friday Agreement” was passed by an overwhelming majority of voters North and South. The agreement presented something of a Hobson’s Choice for the Irish working-class – which route to an entrenchment of sectarianism do you want to take? Here Gregor Kerr looks at the reactions to the agreement of the Irish left.